There were no huge surprises, and the ‘manufacturing’, ‘information & communication’ and ‘professional, scientific & technical’ sectors continue to have the greatest volume of claims. R&D tax credit claims are concentrated in companies with a registered office in London and the South East, in terms of volume and value. A total of £2.9bn was claimed in R&D tax credits by innovative UK companies during 2015-16. Based on research carried out by HMRC, this £2.9bn of relief may have stimulated up to £6.8bn of additional R&D investment. To put this figure in perspective, £6.8bn is the same as the cost of building Wembley Stadium more than six times over – which, back in 2007, cost £798 million (£1.07 billion today). In a working paper, Evaluation of Research and Development Tax Credit, HMRC assessed the impact of R&D tax credits on R&D investment in the UK. Their evaluation estimates that every pound spent on R&D tax credits stimulates between £1.53 and £2.35 in R&D spend by UK companies. 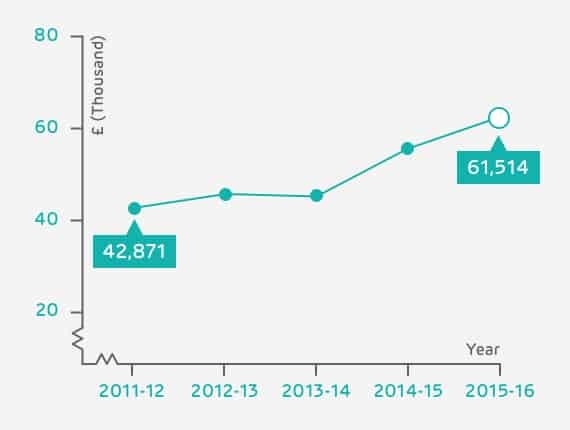 The chart below shows the cost of support claimed from 2000-01 to 2015-16 and the potential range of the additional expenditure stimulated based on this analysis. This is good news for the UK economy. Total tax receipts for 2015-16 were £534bn. This means the £2.8bn spent by the government on R&D tax credits is equivalent to just 0.5% of all money collected by HMRC. In our opinion, this represents good value for money, especially considering how much R&D tax credits are worth in terms of additional R&D expenditure stimulated: £6.8bn. R&D tax credits are not just good news for the economy; they are also good news for the businesses that use them. Our own research tells us that innovative companies use the money they receive to hire new staff, help with cash flow, and gain competitive advantage by investing in further R&D. For Dartington Crystal, for example, their R&D tax credit allows them to begin new engineering projects more quickly with more resource, ultimately improving customer outcomes. It’s all the more important that all eligible companies claim. So, which SMEs claimed R&D tax credits via the SME R&D scheme in 2015-16? And where are those companies based? The average amount of relief claimed via the SME scheme is £61,514, compared to £56,223 last year. This continues the positive trend of the last five years and supports the idea that once a company claims R&D tax credits, it continues to make further investment in R&D. In addition, as companies become more familiar with the requirements for making an R&D claim, it is likely that they will start to implement record keeping processes to enable them to capture expenditure more accurately, leading to more robust, and often larger, R&D tax credit claims. 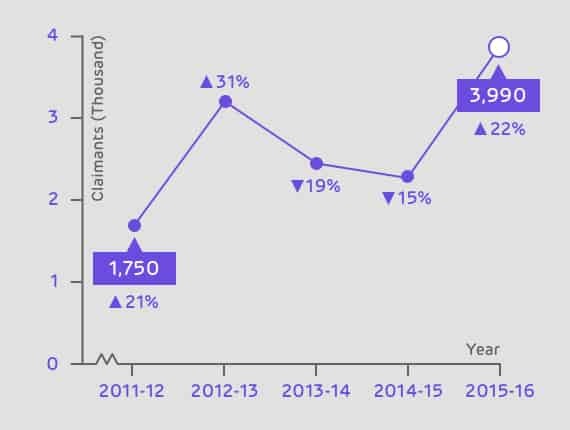 The number of SME claims increased to 21,865, up 22% on last year. 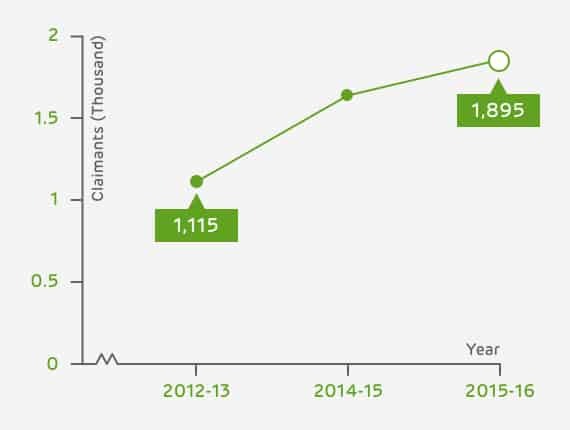 This bucks the recent trend which saw the rate of growth decrease year on year – more claims overall but fewer new claimants each year. This positive news suggests awareness of R&D tax credits is increasing amongst SMEs. However, there is still work to be done as it is universally recognised that the SME R&D scheme is under-utilised. 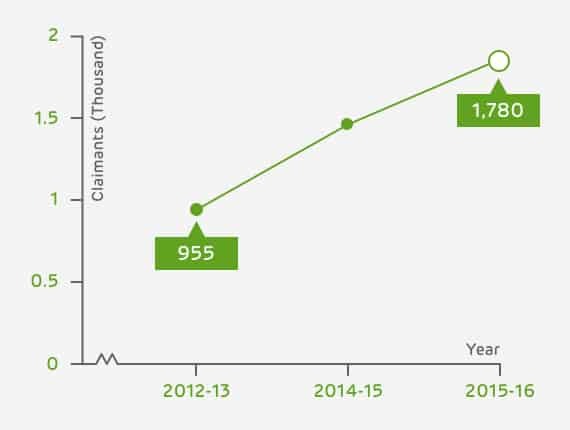 The number of large companies claiming R&D tax credits via RDEC continues to increase, following its introduction in 2013. This means RDEC has undoubtedly done its job of attracting larger firms. Although the rate of increase was not as large this year (13%) as it was the year before (50%), it should be seen in the context that over 99% of UK businesses fall into the SME bracket. Therefore there are simply fewer large companies in total and we cannot expect the initial rate of increase to continue at the same pace. The success of RDEC is most evident when we look at the use of the large company and RDEC schemes by SMEs. An SME might make a claim via one of these schemes, if for example, it had received a grant or it undertook R&D as a subcontractor. After eight years of zero growth, we believe the introduction of RDEC has led to increasing numbers of SMEs claiming via the RDEC scheme (up 207% from 2012-13 to 2015-16). The amount of relief claimed has seen meteoric growth – up 850%. of R&D expenditure is stimulated. of R&D expenditure could be stimulated. At this time last year, we published research that found that whilst 80% of companies intended to innovate in the next three years, only 20% were intending to make an R&D tax credit claim. This discrepancy represents a big gap to overcome. We already know that those claiming could collectively be contributing up to £6.8bn per year to the UK economy. 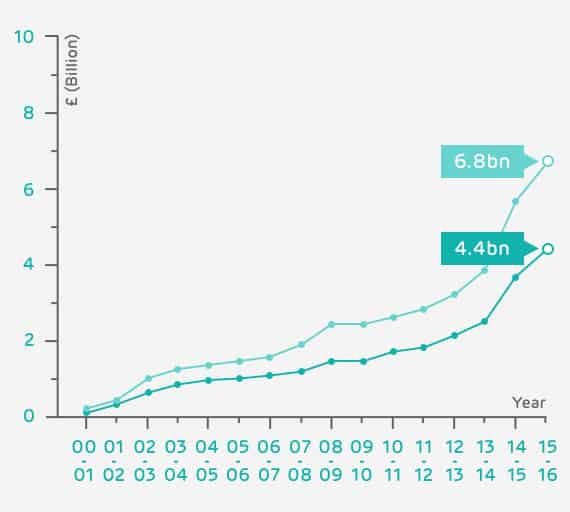 If we can close this claim gap, the remainder could add a further £27bn in R&D investment. To do so, we need to increase awareness of R&D tax credits. How do we do this? HMRC’s R&D tax credits statistics 2017 show that companies have embraced RDEC since its introduction in 2013. Interestingly, it is SMEs who have proven beyond a doubt that they are not put off by a new scheme. We believe the success of RDEC is the big story this year and a big opportunity for the future. RDEC was designed to ensure that both profitable and loss-making companies could benefit from R&D incentives – and it’s popularity can be attributed in part to this. RDEC is more independent of the company’s tax position, and the benefit a company is likely to receive is easier to forecast. In this way, it provides far greater stability compared to the previous large company scheme and the SME scheme. This makes it easier for companies to factor R&D relief into their investment decisions. Introducing the RDEC model for SMEs and large companies alike would reduce the overall complexity of R&D incentives. The government would still be able to target relief to SMEs. It could offer an SME RDEC rate to deliver a benefit comparable to the current SME R&D scheme. We believe this change would similarly increase the number of claims made by SMEs for the same reasons as it has done large companies so far. Ultimately, RDEC for all offers a more attractive way of positively influencing investment decisions and in turn, would boost the overall level of R&D activity in the UK.